The Hotel Riu Palace Peninsula (All Inclusive 24h) property is situated on a beautiful stretch of sandy white beach and crystal clear turquoise water. The grounds are landscaped by tropical vegetation making it a breath taking atmosphere. Take care of your body in the RENOVA SPA where you have a variety of treatments to choose from. The hotel also has a sauna, jacuzzi and 4 pools with one separate pool that has a walk up bar where a cocktail or two is a must. If you want to stay fit while on vacation the resort does have a gym and offers sport activities, volleyball and also water sports such as kayaks and snorkeling. 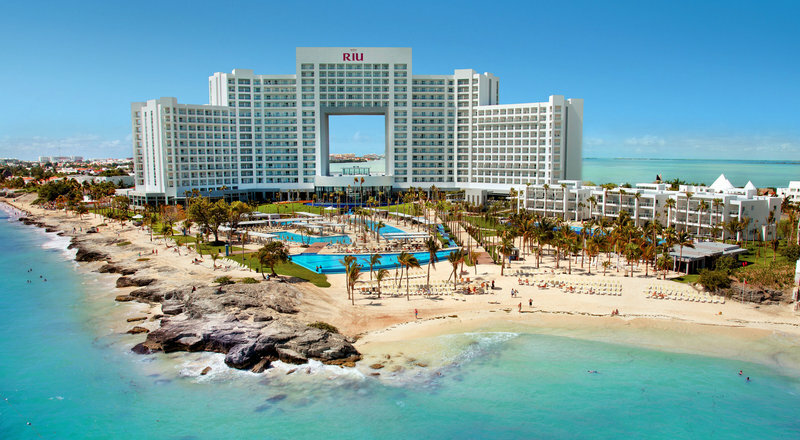 RIU also has the RIULand Program for the little members of your family 4-12 years of age. They have plenty of amusement activities during the day for the kids. Adults will not be bored since they have games, music and other entertainment during the day and night. The Palace Peninsula has 562 rooms that are all junior suites or suites. Each room has a liquor dispenser, stocked mini bar, safe, free Wi-Fi, and balcony. The ADULT only villa section (for adults over 18) has a concierge service, private pool with exclusive waiter service and a Kulinarium restaurant. The all-inclusive system invites you taste a variety of local and international foods. It has six restaurants from buffets to Japanese, Italian, Mexican restaurants and also 24 hour room service. They also have 6 bars from the lobby to the beach.